Isn’t this perfect? According to Charter cable, you have no right to get what you pay for! 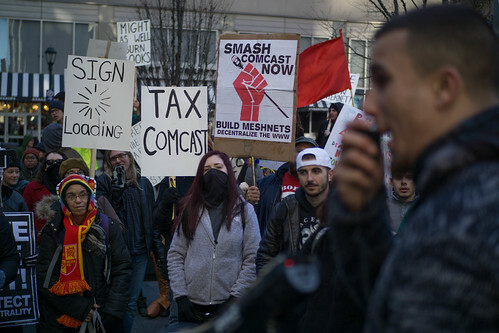 While people remain exclusively fixated on the telecom industry’s attacks on net neutrality, the reality is companies like Comcast, Charter, AT&T and Verizon are busy trying to eliminate nearly all federal and state oversight of their businesses. And while deregulation has its uses in healthy markets as part of an effort to protect innovation, you may have noticed that the telecom market isn’t particularly healthy. As such, the end result of eliminating most meaningful regulatory oversight without organic market pressure in place is only likely to make existing problems worse. This battle is getting particularly heated on the state level. After the Trump administration dismantled net neutrality and consumer privacy protections, states began flexing their muscle and attempting to pass their own privacy and net neutrality rules. ISP lobbyists, in turn, tried to head those efforts off at the pass by lobbying the FCC to include (legally untested) language in its net neutrality repeal “pre-empting” states from being able to protect broadband consumers in the wake of federal apathy. And in the wake of the net neutrality repeal, companies like Charter (Spectrum) are trying to claim that states have no legal authority to hold them accountable for failed promises, slow speeds, or much of anything else. For example, Charter is already trying to use the FCC net neutrality language to wiggle out of a lawsuit accusing it of failing to deliver advertised speeds. And the New York Public Service Commission also recently stated it found that Charter has been effectively lying to regulators about meeting conditions affixed to its $89 billion acquisition of Time Warner Cable and Bright House Networks. As part of the deal, Charter was supposed to deploy broadband to a set number of additional homes and businesses, but regulators found (pdf) several instances where Charter actively misled regulators. Sharon Robinson on Why are so many consumers cutting the cable cord? Sadat Kent McArthur on Why are so many consumers cutting the cable cord? John Jordan on Why are so many consumers cutting the cable cord?